Business owners may need to consult with a qualified legal professional in several situations, two of which are business dissolution and partnership disputes. If you face either of these situations, you should always have an experienced St. Louis business attorney representing you to ensure that your best interests are protected. If you need assistance, call the Law Offices of Kenneth P. Carp at (636) 947-3600 for a free consultation today. It is important to explore all possible options prior to handling a dispute and an experienced lawyer can help you choose the most efficient, cost-effective form of dispute resolution for you. Just as you must follow certain steps to start a business, you also must follow certain steps to end—or dissolve—a business. In many circumstances, you will have to file an Articles of Dissolution with the Missouri Secretary of State, who then must certify the dissolution. You will have to notify all creditors and settle any debts the business has, as well as file final federal and state tax returns. All business accounts must be canceled and all assets distributed among owners according to any prior agreements. This process can be quite complicated and therefore it is always wise to seek the assistance of an experienced business attorney. If you have a business in the St. Louis or St. Charles area and are facing a dispute or impending dissolution, it is highly important that you are represented by an attorney who is experienced in Missouri business law. 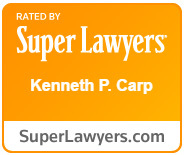 Kenneth P. Carp has over 20 years of experience helping to protect the rights of Missourians in legal matters and strives for the best possible outcome in every individual case. If you need legal assistance, you can schedule a free consultation by calling (636) 947-3600 today.